Testing! Testing! Testing! 1 2 3 Testing! There is a verse in the song “The Anchor Holds,” that goes something like this, “And It was in the night that God proved His Love for me.” One of the unique Blessings of Christmas is God did not reach out and take our hands and lead us through life. He literally put skin on and made a humble and meek not-so-grand entrance not just into the world but into our lives as well. Before going further please note the Psalmist writes, “and tested your faith,” God indeed does put us to the test just as He did Moses and his people on their 40-year trek through the wilderness. And from what I can tell their testing ended at Meribah when Moses used his staff to make water come from a rock. Wandering in the desert tired, scared, lost, hungry, thirsty they cried out to God and after the test ran it course God, in His own time and own way provided all the water they could drink. And the same God still tests His people today and when the testing runs His course He goes about making the impossible possible for those who Love and Follow His Son Jesus. 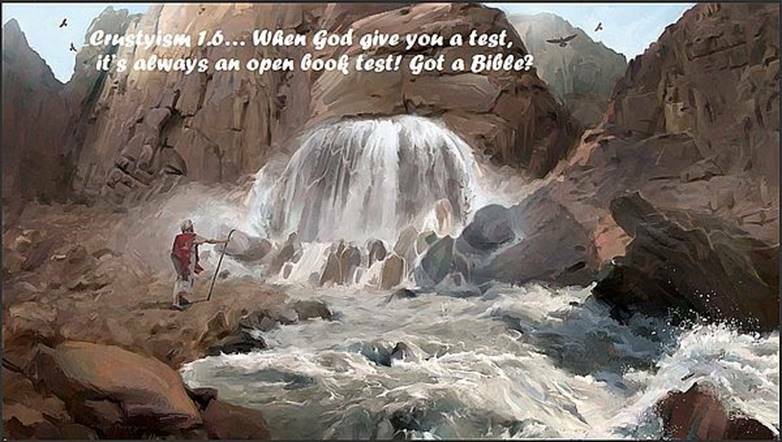 Crustyism 1.6… When God test you it’s always and open book test! Got a Bible?